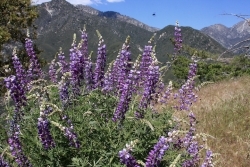 Saturday, June 1, 2013: Glendora Ridge Road: Glendora Ridge Road is one of the gems of this area for spring wildflowers, and it’s three years since we visited it on a chapter field trip. We’ll take a one-way car tour from west to east along the entire length of the road, approximately 12 miles, between its junction with Glendora Mountain Road and Mt. Baldy Village, stopping multiple times at key points of interest, where we can take our time exploring along the road. Leader Graham Bothwell (webcontact@cnps-sgm.org, 626.449.8392). After the tour, we can eat our lunches at the picnic tables across from the Trout Ponds, on the northern side of Mt. Baldy Village. Directions: From the 210 Freeway, take Grand Ave exit in Glendora, and go north to Sierra Madre Ave. Then go right and continue until reaching Glendora Mountain Road, which is just after Loraine Ave. Proceed north on Glendora Mountain Road all the way to the top of the ridge and the T-intersection with Glendora Ridge Road, where we’ll gather at 9:00 a.m. If Glendora Mountain Road is closed (we do expect it to be open,) alternative routes are up Highway 39, Azusa/San Gabriel Canyon Road to East Fork Road to Glendora Mountain Road, or west from Mt. Baldy Road on Glendora Ridge Road. Please note: No restrooms, no drinking water, no gas, and no picnic areas along the route, and no gas at Mt Baldy Village. There are restrooms at Mt. Baldy Visitor Center (in the village) and at the Trout Ponds. Please plan ahead. Adventure Pass is not required for Glendora Ridge Road, but is required at the picnic facilities across from the Trout Ponds if you plan to eat lunch with us. Further info: See the gallery page from our 2010 visit to Glendora Ridge Road, also Bob Muns's checklist for Glendora Ridge Road and Jane Strong's May 2010 supplement to the checklist. Michael Charters has an extensive photo gallery of Glendora Ridge Road from May 2010, and another of the San Antonio Canyon area in June 2008 that is largely relevant to Glendora Ridge Road. All text on this page is Copyright © 2010-2019 CNPS San Gabriel Mountains Chapter unless otherwise indicated. All photos are Copyright by the authors.